The Choice is a Virtual Reality experience inviting you to enter the digital consciousness of a virtual woman dealing with an unplanned pregnancy. It features holographic video interviews with women who share what shaped their decision to have an abortion. The main goal of the project is to influence empathy and understanding in a positive and constructive manner and to change how we talk about abortion. As abortion rights in the United States are under attack from the current Trump administration, once again access to abortion has become a pressing public issue. Last weekend’s Women’s Marches that took place in major US cities gave us an idea of how people feel. I was motivated to make the movie due to situation in my home country, Poland, where the government is actively seeking to further restrict the already incredible limited access to abortion. Me and my team work in Canada where abortion also remains a complicated and controversial subject. I want to create compassion. Not everyone can feel how it is to be pregnant: cis men are the obvious example but there are also women who cannot or don’t want to get pregnant. I want them all to be equal and supportive partners in this debate so I need them to understand even just a fraction of what it would feel like to be in this situation. I want The Choice to be the tool that gives them the opportunity to gain this perspective and I am using the newest cutting-edge technology to do it. When you put on the VR headset, you “wake up” to realize that you are in someone else’s body – a woman’s body. You hear a voice inside your head: “How could this happen? What should I do?” These words float through the air around you, making you feel as though the thoughts are yours – that this panic is yours. As your mind searches for answers, real women appear in this space with you. They speak to you about what shaped their decision to terminate their pregnancy and the emotions they experienced. I interview women with different stories, diverse backgrounds and unique situations. We’ve been working hard for the past year. Creating the technology to show those stories in an engaging way involved not only building the prototypes of the cameras, but also doing detailed research. The Choice is built inside a 3D game engine, combining video recordings with live rendered graphics so when the viewer enters the virtual world, they feel presence in it. Unlike in case of a traditional video, your natural movements are reflected in how your eyes and ears perceive the virtual world, allowing you to feel totally immersed in the fictional woman’s consciousness. Your mind feels as though the objects and people that appear before you are real, and the women you meet are also present with you in this virtual space. VR gives us the opportunity to put viewers into situations they could not experience in real life. We do not know how we’d behave – we do not have a social script – most of us can never know how it feels to be a refugee, a blind person or a prisoner. Similarly, many of us will never know how it feels to consider having an abortion. Creating that situational empathy is the biggest goal of this project. The important aspect of using VR is also that with a headset on you are entering a unique, private space. There are no glances across the room from strangers, hushed whispers or nearby friends reading your face. Whatever your opinion on the topic of abortion, when you immerse yourself in The Choice you are free to share as much or as little about its impact as you want. We’ve launched the Kickstarter campaign because we need support to move forward with the production. VR production is more expensive than traditional documentary. To produce the whole experience, we need around CA $100,000, and we’re looking to Kickstarter for the first CA $15,000 (£8,602). This jumpstart funds will allow us to build the pipeline and architecture that underpins The Choice as an application and to give it a solid framework for the documentary to be built upon. We feel strongly about this subject and we believe that our creative concept and use of the newest VR technology offers an interesting approach to thinking about the right to choose. Contribute to our project and help us create this valuable tool for discussion, understanding and empathy. Go to Kickstarter page to donate. 1. Home screen of a VR project, lettering: “The Choice. 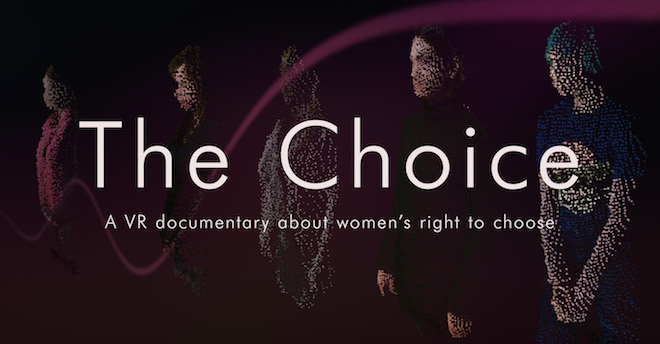 A VR documentary about women’s right to choose”. It features five pixelated silhouettes of women against burgundy background. 2. 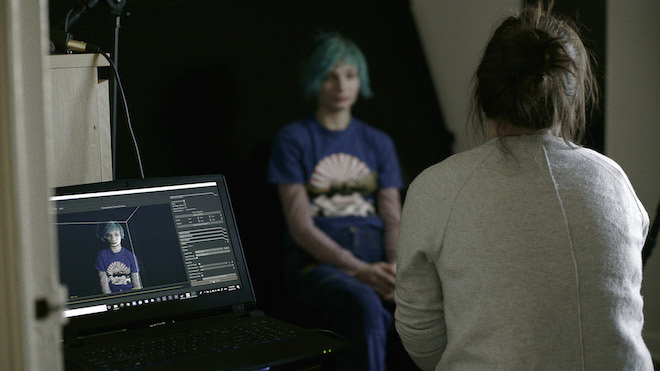 A person with cropped blueish hair, blurred in the background, is being interviewed by someone with their back to us. The interviewer’s back and the preview of the recording are sharp in the foreground. It’s the director interviewing one of the contributors. 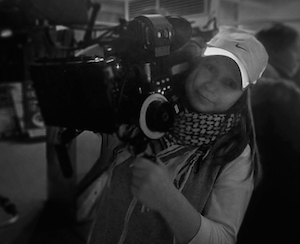 3.Black & white portrait of director Joanne-Aśka Popińska wearing a white Nike baseball cap, holding a camera.